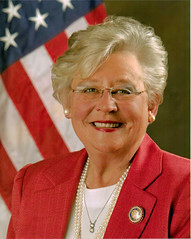 This entry was posted in Campus Announcement, Events and tagged graduation, Kay Ivey on July 30, 2012 by Wire Eagle. AUBURN UNIVERSITY – Alabama Lt. Gov. Kay Ivey will be the guest speaker during Auburn University’s two summer graduation ceremonies Saturday, Aug. 4, in Auburn Arena. A 10 a.m. ceremony will include the colleges, schools and programs of Architecture, Design and Construction; Engineering; Forestry and Wildlife Sciences; Interdisciplinary Studies; Liberal Arts; Nursing; and Sciences and Mathematics. A 2 p.m. ceremony will be held for the colleges and schools of Agriculture; Business; Education; and Human Sciences. Both ceremonies can be viewed live through the university’s website at www.auburn.edu/graduationlive. Ivey, a Camden, Ala., native and a 1967 graduate of Auburn University, was elected lieutenant governor in 2010. Previously, she was elected state treasurer in 2002 and 2006.